Ciro Víctor Estrada Cervantes was born in Qanchis, Sicuani, which is located in the Qosqo region of Peru. He studied at the University of San Antonio Abad of Cusco, in the Faculty of Human Sciences, where he obtained a degree in Tourism. Qanchis, the name of Victor’s birthplace means seven (7) in the ancient Inca language, cosmic language of the Self-fulfilled Human Being, because number seven in the sacred language is interpreted as Point of Equilibrium. Since 1980 Victor has studied, investigated and practiced Andean phylosophy, arts and techniques related to gnostic science, parapsychology or metaphysics, trascendental psychology and theosophy of spiritual schools. Concurrently, he is initiated in and practices the secrets of the ancient “Andean Alchemists.” As an Artisan, he recovers millenary techniques of the Ancestral Andean Shamanic Jewelry, complying with his mission of creating and sharing these magic alchemic instruments, which are totally hand made, using silver, gold, copper, crystals, sea shells, original stones from Peru, in the seven main colors to receive the benefits and the power of the Seven Rays, as our ancestral Atlantis Master did. They are expressed through the techniques codified in the millenary Pre-Inca and Inca myths and recovered through ceremonies of Wachuma or “San Pedrito,” as well as offerings to: Packakamaq, Universal Energy of Father Creator, Recreator and Procreator, interpreted as time; and to Pachamama, Energy of the Stellar Cosmic Mother, which are the Sacred Spaces of all the Visible and Invisible Worlds where Father Creator Creates, Recreates and Procreates, interpreted as space. These Andean shamanic jewels are true Alchemic Instruments, which will make their owner’s path in life easier as they progress towards the awakening of the conscience, trying to reach self-knowledge in the way to self-fulfillment, practising daily and constantly in the service of love. The Metals symbolize the solidification of cosmic energy, which is why G. Yung said “base metals are like physical desires and passions, and transforming them into greater quality is equivalent to the liberation of the creative energy from the ties of the sensitive world…” And Victor Estrada says that G. Yung refers to the process of the true Alchemy, which is the Art of Hermes of transformation and transmutation of metals of low vibration frequency, such as lead (low physical desires and passions), into metals of very high vibration frequency, such as gold (point of equilibrium, total balance, prosperity and happiness which is the total harmony of the three bodies: Kay Pacha or physical body, Uju Pacha or mental or psychological body and Hanan Pacha or vitality or higher spirit). Regarding sea shells, the spondylus materializes the golden ruby or orange ray, which provides the human being with internal peace in his relationship with the external world. Referring to the crystals and stones of the seven colours, Saint Jeronimo said “For the tact it is simply a stone, for the eyes it seems water.” For the ancient Andean people, the quartz crystals have been valued for their magic, spiritual and mystic powers, because they interact with the “Bio-Energy,” causing benefits to all levels within our beings. Stimulate and widen the consciousness. Deepen perceptions of subtle dimensions. Balance and harmonize the Bio-Energy. Protect against negative energy and influences. Help in the process of healing (psychophysical or physical), mentally channelling the Healing Energy even from long distances. Enhance potential and amplify the mental energy. Deepen development of meditation techniques. Mainly useful to materialize good health, prosperity and love, because the energy of these shamanic jewels goes through all Light beings, obtaining from them the energy its owner needs at the right moment. Help amplify the energy of the body and the thoughts, reaching illumination. Help keep a lot of information without risking to forget it. Help channel communication with intelligent energies of the animals, the plants and minerals. Consequently, all the psychic abilities are stimulated while using a shamanic jewel, which is the tunnel between the physical dimension and the dimensions of the mind, opening the portals to higher intelligence, to transform the disrupted energy, purifying and balancing these levels. Ancient Andean Shamanic Jewels were considered as “The Light of Universe in its Material Manifestation.” The stones of the seven (7) colours, are the materialization of the seven (7) manifestations or powers of the Cosmos as a contribution to all living beings within the Mama Pacha. This knowledge was developed and well kept by the great initiated Masters of the Ancient School of Hermes Intiq Cintiq Churinkuna Qanchis Illa or Brotherhood of the Children of the Sun and of the Seven Rays. Regarding the Psychotronics of the shapes of the Symbols, each design provides the owner with virtues, gifts and special faculties from the beings that are represented in the Alchemic Jewel. Since 1985, Victor has learned from his teacher Agustín Guzmán (Shaman initiated in the alchemic powers of the Cactus of the deep mysteries), the sacred secrets of the Diven Plant Wachuma or San Pedrito, which would be the Seminal Liquid of the Universe engendering the seed of a New Life inside the beings who ingest this sacrament with deep respect and only in sacred rituals, strictly following the ancestral millenary tradition. Ancient Alchemists named this process as Misterium-Magnum, because it is the knowledge of the use of subtle forces in the Divine Nature to obtain the Philosopher’s Stone and the Elixir to reach eternal life. The Philosopher’s Stone in the Andes would be the Spinal Column of America formed by the largest mountain range in the planet, of high sacred mountains with snow peaks reaching an altitude of 7,000 metres above sea level. These peaks of eternal snow are the Vortexes of Cosmic Healing and Harmonizing Energy, which are the Higher Magnetic Fields in the planet for the following 2,154 years. Therefore, the stone constructions built by our ancestors in their Power Temples are the sacred spaces where those who search and walk in the Light can become Architects of Their Selves. The Elixir to reach eternal life would be the Entheogen Plants or Teacher Plants, and one of the many existing is undoubtedly Wachuma or San Pedrito. The Elixir is the fundamental principle of alchemy, it is the mestrum universale, which is the universal master through which all bodies can become Summa Materia (their original substance) or Divine Origins. The alchemy is the process of metamorphosis of becoming a butterfly that opens its multicoloured wings to fly, after having been a worm crawling on the ground. We could say that the alchemy is the spiritual science of transformation and transmutation of human beings into Light Beings. Wachuma, which permits the completion of this metamorphosis, has the ability of opening the heart of the human beings, releasing the blockage of the energy channels. In that way, beautiful and multicoloured wings grow on the human being and he becomes an Angel, then plurality becomes a unity, the human being joins God for eternity here and now, living the present intensely. At the beginning, alchemy was experimented only in the physical field, then it was discovered that the great and true alchemists were at the same time great philosophers, mystic beings and healers nowadays called shamans. First, they made of the alchemy a secret science which studied the evolution of the spirit and then it became a spiritual science in the search of the path to obtain Transformation and Transmutation. The alchemy was the pioneer of the modern chemistry, such as astrology was to astronomy. The Elixir of San Pedrito obtains Transformation and Transmutation, using the electromagnetic forces of the eternal and infinite substance named Pacha, in its infinite manifestations in macro and micro and in all dimensions of the visible and invisible worlds, mainly through the K’uychi (Rainbow), which represents the wise use of the seven powers of God. During the learning time and practise with Wachuma, Victor experimented countless events of transformed lives for the divine service, serving the cosmic plan through the service on behalf of humanity. Part of this wonderful learning is to understand the Totem Animals: the Puma, Amaru (Sacred Feathered Serpent) and Kuntur or Condor. Victor develops programs for the beginning awakening of the conscience or to experience higher states of consciousness in parallel dimensions in the Sacred Spaces, which are the Fields of Power of greater magnetism and spiritual strength for the New Era, in Peru and its Sacred Centres. Complying with his mission he also carries out: Ancestral Rituals, reconnection with the sacred nature, recover self-esteem, equilibrium of the seven solar plexus of the seven bodies, harmonization of the three fundamental bodies, among others. He effectively combines many millenary techniques. In summary, Victor Estrada is a Hampeq or Healer, and Artisan in Ancestral Andean Alchemy and a guide of spiritual groups. He is married and currently lives in Qosqo-Peru. 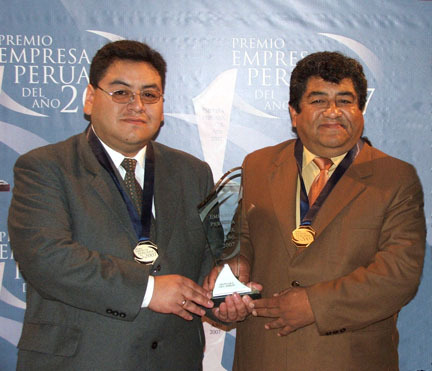 His two children: Victor and Clariza, as well as his wife Luisa, work with him at Andean Magic Art Jewelry.